Notes: Buchanan Castle is a ruined country house in Stirlingshire, Scotland, located 1 mile (1.6 km) west of the village of Drymen. Originally the home of the Buchanan family, it passed to the Grahams in the 17th century. The old house burned down in 1850, and the present house was built by James Graham, 4th Duke of Montrose, in 1854. The roof was removed in 1954, but it remains the seat of the Clan Graham. The estate was in the possession of the Buchanan family from at least 1231, but the family line failed in 1682. The estate was bought by James Graham, 3rd Marquess of Montrose (1657-1684), whose son became the 1st Duke of Montrose in 1707. The architect William Adam prepared designs for the house and parklands in 1745. In 1790 William Henry Playfair was commissioned by the 3rd Duke to design alterations to the house. James Graham, 4th Duke of Montrose (1799-1874), and his wife raised and trained racehorses on the estate in the 19th century. The old house was destroyed in a fire of 1850, and the duke commissioned William Burn to replace it. 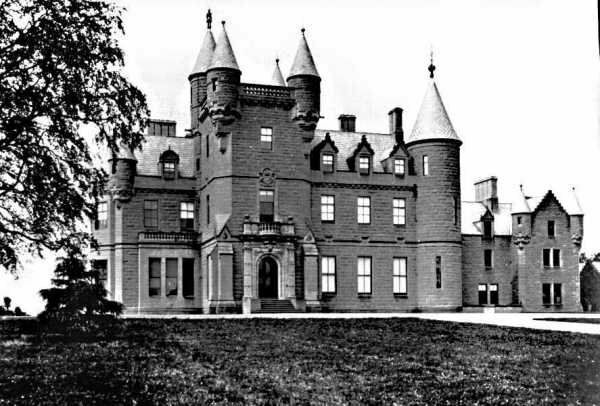 Burn designed an extravagant manor in the Scottish baronial style, enclosing an L-plan tower in a clutch of turrets, bartizans and stepped gables. The Dukes remained at Buchanan until 1925, when it was sold. In the 1930s the house opened as a hotel and the golf course was established in the grounds. Plans for residential development on the estate were delayed by the outbreak of the Second World War, during which the house was requisitioned. It was used as a hospital during the war, with patients including Rudolf Hess, who was brought here after his flight to Scotland in 1941. After the war the building served briefly as the Army School of Education. The roof was removed from the house in 1954 and outlying parts of the building were demolished. A number of residential buildings were subsequently built in the castle gardens and grounds. Proposals were put forward for redevelopment of the house as flats in 2002 and 2004, though both applications were refused planning permission. The house is a category B listed building, and is included on the Buildings at Risk Register for Scotland. The grounds of the house are included on the Inventory of Gardens and Designed Landscapes, the listing of nationally significant gardens in Scotland. The walls of the house remain intact to their full height and are considered to be in good condition. The ruins are progressively engulfed by trees and plants, and surrounded by a perimeter fence. A ghost has been reported as haunting Buchanan Castle, manifesting itself as "Strange whisperings and sounds" during the "summer months between 23:00h and dawn". This was investigated by Peter Clive, Aidan Keane, Andrew Conway and Gavin Starks and found to be due to young owls nesting in one of the turrets.